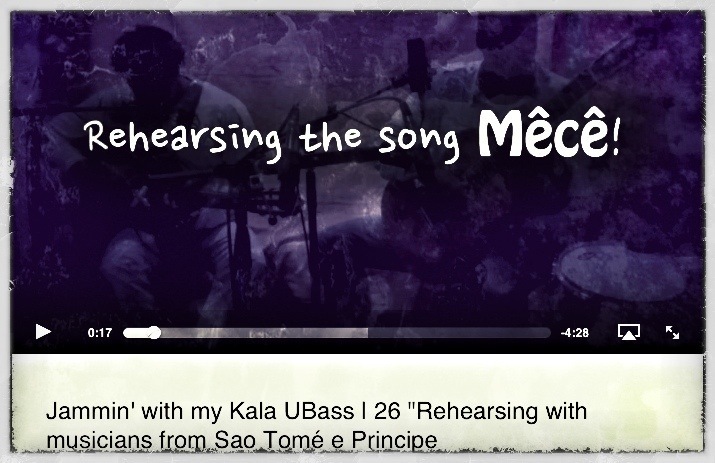 Jammin’ with my Kala UBass | 26 In my studio with musicians from São Tomé! – Play UBass! Jammin’ with my Kala UBass | 26 In my studio with musicians from São Tomé! A while back I did a blog post about rehearsing with musicians from São Tome e Principe for a couple of outdoor shows. We did the shows in the end of August and after those I managed to invite Oswaldo, Guilherme and PA to my home studio for some jammin’. The song featured in the YouTube-clip below (‘Mêcê’ (Desire) was one of the songs we played. The song is written by Oswaldo and Guilherme. The other song ‘Every day’ (Written by Guilherme) will hopefully end up on the upcoming Ubass CD! I’m overdubbing some parts and will start mixing that song soon! Although the take of ‘Mêcê’ wasn’t perfect we sure had so much fun playing together and I hope this transcends through the computer screen! A big thank you to Oswaldo, Guilherme and PA for those great musical moments in my studio that late August evening! I have some video from the actual shows too. I’ll post this later. Stay tuned for more! < Road Toad Music: A big thank you to Owen and Janet!